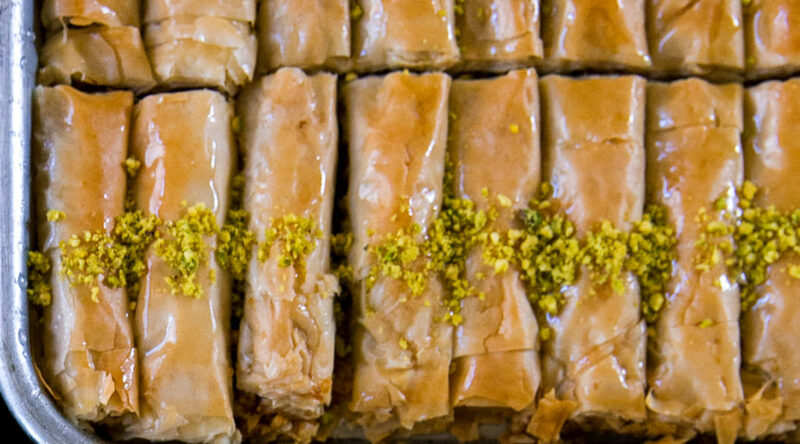 At the Scottsdale, Arizona farmers’ market, Noor Al Mousa—a Syrian baker who’s part of the Syrian Sweets Exchange organization—sells an array of baklava. This rolled form is the lightest, most delicate, and most popular, maybe because it’s so easy to pop in the mouth. Make syrup: In a medium saucepan over medium heat, bring sugar and 1 cup water to a boil, stirring occasionally. Add lemon juice. Reduce heat to an active simmer and cook, stirring occasionally, until slightly thickened and reduced to a scant 1 3/4 cups, 10 to 12 minutes. Remove from heat, stir in 1 tsp. orange blossom water, and let syrup cool. Preheat oven to 350°. Make filling: In a large bowl, combine 1/2 cup of the syrup with remaining 1 tsp. orange blossom water, then toss with walnuts. To shape, lay 1 filo sheet flat on a work surface and brush all over with butter. Lay a second sheet on top and butter again. Sprinkle 1/3 cup nut mixture (don’t pack to measure) in a narrow, very even band about 2 in. from edge of the long side closest to you. Starting from that same long side, fold filo over nuts, pressing to seal, then tightly roll to make a skinny log. Set log seam-down in a buttered rimmed baking sheet and brush with butter. Repeat to make 12 logs total and fill pan. Cut logs crosswise into 5 equal pieces about 3 1/2 in. long. Bake until deep golden, rotating pan halfway through cooking, about 30 minutes. Using a soup spoon, evenly coat hot baklava with 1 cup syrup. (Save leftover syrup for other uses.) Sprinkle center of each piece with a generous pinch of pistachios. Let cool at least 1 hour. At supermarkets, check packages of frozen, paper-thin filo dough carefully for size (you want sheets about 12 by 17 in. ), and buy more than 1 box, as the quantity of sheets per pound varies by brand. To help prevent cracking, thaw in the refrigerator overnight, not on the counter.